If you’re not going for the tucked-in look and don’t want your pants to hang over your shoes, rolling them up is a stylish alternative. 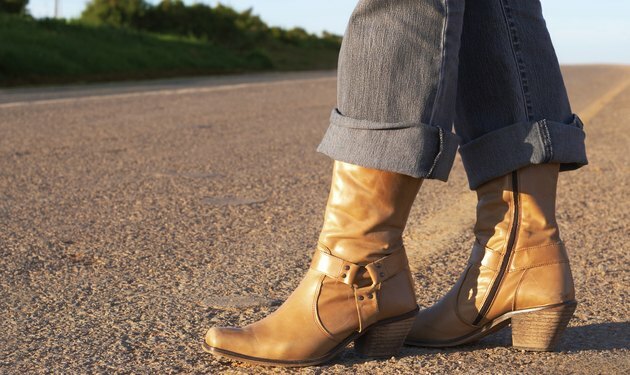 Although you can cuff your pants many different ways, rolling them really tight at the bottom -- also called a tight roll, peg roll or pin roll -- provides a casual, trendy look to show off stylish shoes, boots or socks. This roll works best with boot-cut or straight-leg pants or jeans. Grab the bottom hem of your pant leg right in the center. Pull the fabric of the pants away from you so that it’s taut. Pinch the pants at the ankle with your other hand right along the inseam. Make the pinch tight so that the fabric of the pants presses firmly against your ankle. Fold the fabric that you are holding outward toward the outer seam of your pants. Cuff the fabric once, then again to form the tight roll. Repeat the process on the other pant leg. You can roll the tight roll-up more than twice depending upon the height you want the roll.